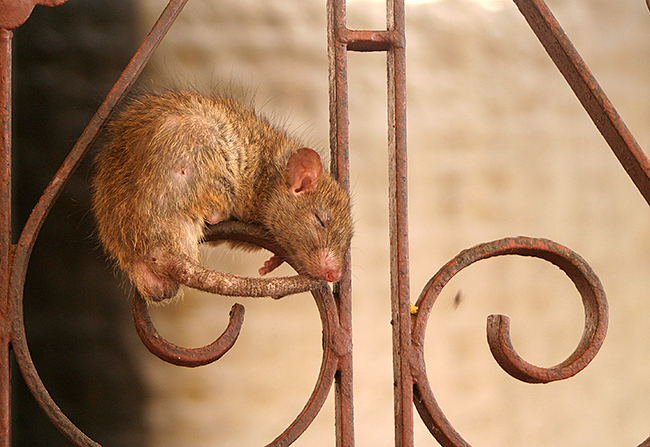 Rats and Religion | Julie O'Neill Photography. It fasci­nates me how our small world is filled with such vast beliefs, tradi­tions and religions. But what intrigues me more than the differ­ences are the similar­i­ties. Take religion for example, whether it be the Koran or the Bible all religions preach to be kind to each other, to animals and the planet. The common thread of compas­sion runs through all religions. Although, I don’t person­ally follow one organized religion I appre­ci­ate elements of several. I used to be on a search for the religion that suited me most, I now acknowl­edge that my religion is truly my own. It’s an individ­ual belief system that combines many aspects of differ­ent religions with some of my own. Much of it is about peace, respect, and animals! For me “God” repre­sents love, purity and nature. Who fits this descrip­tion better than animals? I can’t count the number of times that I have looked into the eyes of an animal and could see an angel looking back at me. Animals live their lives innocently, purely, for their families, and for love. So many of us turn to religion for answers, I believe that if more of us were to turn to nature and to animals we just might find what we are looking for. All faiths and religions include animals and nature in their doctrines. In Chris­t­ian faith it is stated that we are the stewards of nature and animals. The Bible says that God expects, even demands that we respect and take care of ALL of his creations. 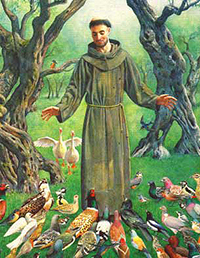 Saint Francis of Assisi, one of the most popular saints of the Catholic Church felt at one with animals. Not only did he preach that animals should be treated with respect, but he preached directly to the animals. There are several famous stories of him speak­ing directly to birds, rabbits, fish and wolves. In Chris­t­ian belief the most innocent and perfect place is the Garden Of Eden. In the Garden of Eden before the fall, animals and humans lived together in utter peace, both eating only vegeta­bles and no one was ever killed nor harmed. In Buddhist thought animals are sentient beings, differ­ent from humans in their intel­lec­tual ability but no less capable of suffer­ing. Animals possess an equal poten­tial to become enlight­ened. There­fore, any human could be reborn as an animal, and any animal could be reborn as a human. An animal might be a reborn dead relative, and if you looked far enough back into one’s infinite series of lives you would eventu­ally find every animal to be related to you in some way. Within Native Ameri­can beliefs every­thing is sacred from the largest mountain to the small­est plant and animal. In Native legends animals are frequently gifted with the power of speech and other human attrib­utes. Animals are consid­ered equal to humans sometimes even superior. For example, eagles fly the highest of all living beings, and have eyesight that can see into the soul. Of all religions I find myself repeated drawn back to Hinduism. Animals play a huge role in their culture and religion. Through­out India animals can be seen living on the streets among people, as well as appear­ing in decora­tive art on temples and homes. 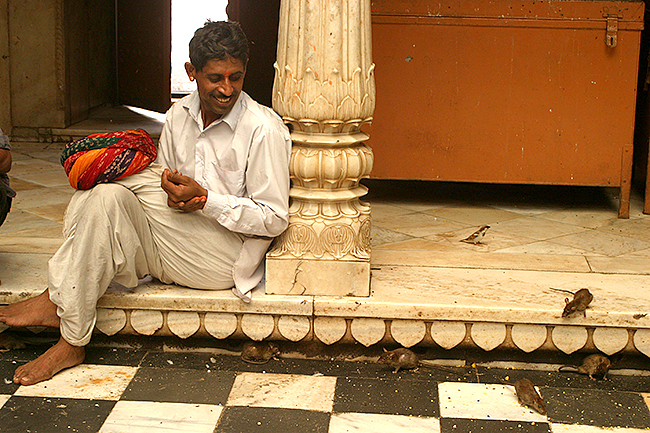 Animals also play a very impor­tant role in Hindu belief. Animals are frequently mentioned in Hindu myths and legends. Spiri­tu­ally, there is no distinc­tion between human beings and other life forms, all are manifes­ta­tions of God and possess a soul. The Hindu god Buddha declared that all beings currently living in an animal form have been our mothers, broth­ers, sisters, fathers, children, and friends in past rebirths. One could not, there­fore, make a hard distinc­tion between moral rules applic­a­ble to animals and those applic­a­ble to humans; ultimately humans and animals were part of a single family. We are all interconnected. I just love this idea. 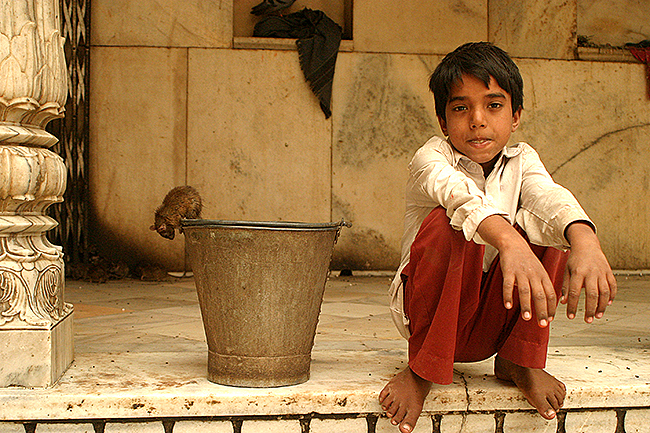 Animals in Indian society is one of the main elements that constantly pulls me back to India. Mix animals together with the utterly bizarre and I’m there. 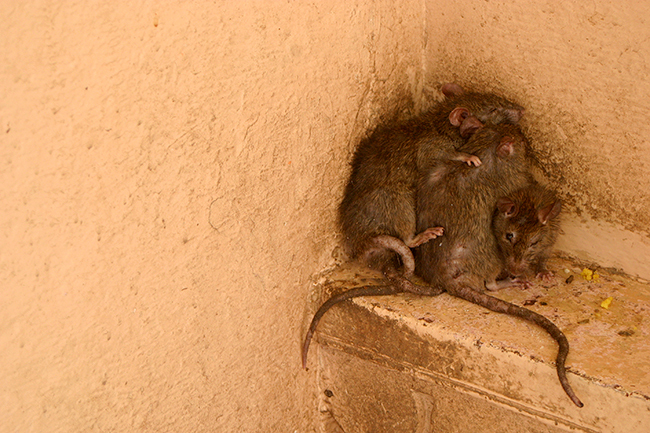 This is exactly what I found at the “Rat Temple” just outside Bikan­ner. It’s actually called the Karni Mata Temple, and was constructed in the early 1900’s as a tribute to the rat goddess Karni Mata. It is a beauti­ful build­ing constructed primar­ily with intri­cate marble panels and decorated with splashes silver and gold. It’s quiet and peace­ful inside just as any temple should be. Out of respect each visitor (thousands of Hindus travel from all over India to visit each year) must remove and leave their shoes at the door. 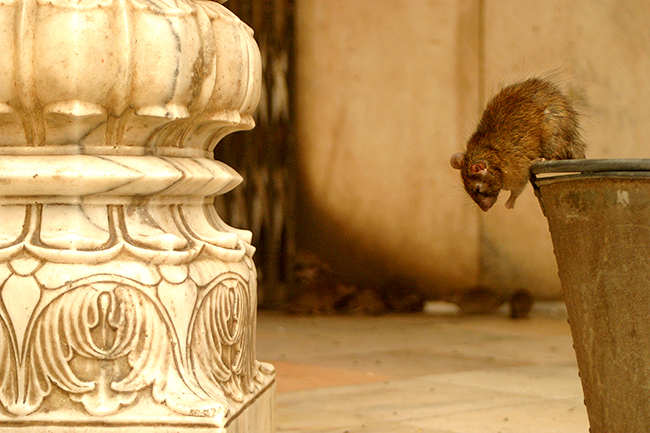 It looks similar to all of the other immac­u­late Hindu temples that can be found through­out India, except that this temple is home to around 20,000 rats! 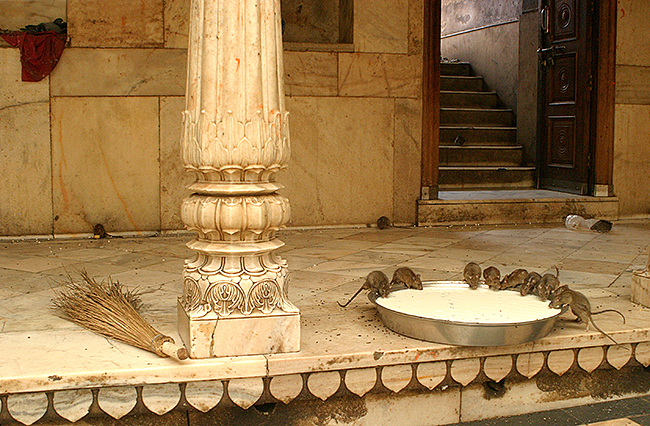 While rats are seen as dirty and diseased pests in most circles, inside this Hindu temple they are sacred. In fact, to have one touch you or to scurry over your foot is a blessing. 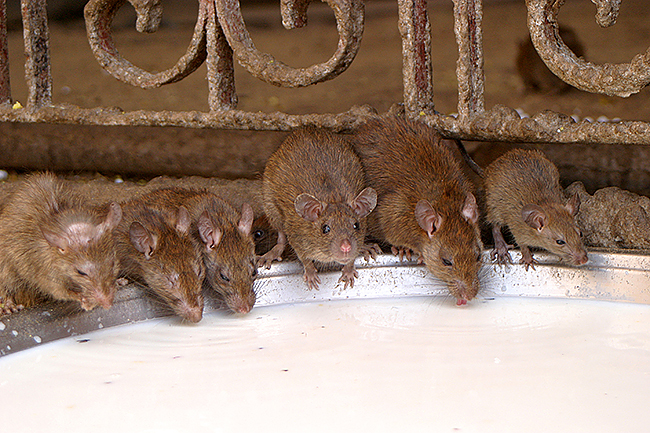 Since I visited the “Rat Temple” I have spent alot of time think­ing about the concept. It warms my heart. If we can have respect and even worship a rodent that is commonly thought as of a dirty scoundrel, then just imagine what is possible! I agree 100% with your concepts about spiri­tu­al­ity. “Organized religion” has caused more war than peace, more blood­shed than acceptance.….it’s a way to control people using fear of the unknown and herd mental­ity instead of individ­u­al­is­tic thought. Donna first of all I want to thank you for reading the blog and for your comments. I just want to make sure that you didn’t misin­ter­pret my words. Although I do not follow one religion I certainly am not anti-religion. I am in fact the opposite. I love learn­ing about religion and have respect for all schools of thought and beliefs. I have so many wonder­ful friends from all religions whom are devout to their beliefs. Religion brings much peace to many people. Greed for money and power create war, religion is often used as the fall guy. As far as the rats go.… Well there is no “common rat”. A rat is a rat. A dog is a dog. A child is a child. Each individ­ual cherishes his or her life just as much as the next and has just as much right to live the life that they were given. Must we really differ­en­ti­ate between the animals that we protect and the ones that we kill “for the good of society”? What I want to share in this blog is the concept that we DON’T have the right to deter­mine who shall die and who shall live, who is worth­less and who is godly. At this temple rats are God. It is THEIR society which rules. There­fore to follow your theory that those that spread diseases should be exter­mi­nated, it would be mass killing of humans. Killing is never good for society. There are other answers to living health­ily and peace­fully together, whatever the race, religion or species. I just want to say, beauti­ful pictures. 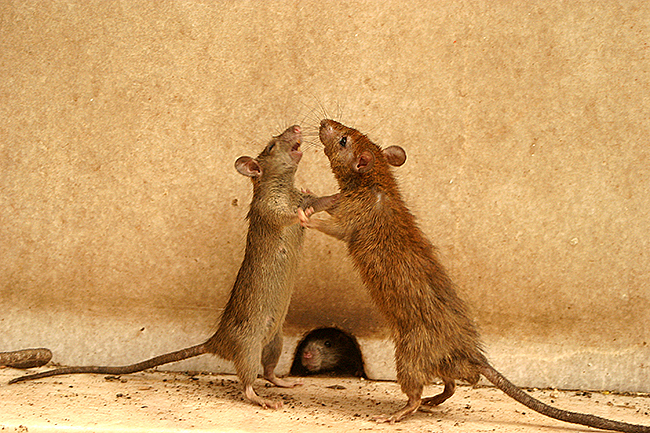 The fight­ing rats and the sleep­ing one reminds me of my babies, my compan­ion animals — degus. 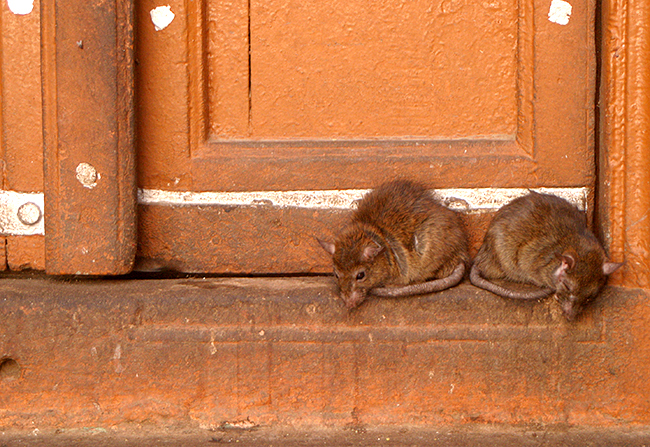 Although quite differ­ent from rats, they have some similar traits. part of it and i also have you saved to fav to check out new stuff in your site.